July 26, 2014 – The suffering began almost immediately, writes Ruairi Ferrie. Nine club members turned out at the Maldron Hotel on Saturday morning for what was to be a much hillier spin than expected, thanks to our guide Kevin McNamee, who, apparently, had decided to punish us all. 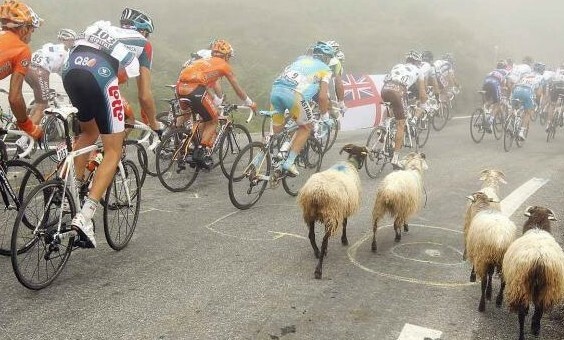 Pock-marked tarmac, low clouds and rogue sheep caused a four-man breakaway on the Gap Road. The pain began with the ascent of the Bohernabreena Road up through Glenasmole, and continued as we rounded the reservoir and emerged at Ballinascorney – which gave rise to some nightmarish hill TT flashbacks. There was plenty of competition for KOM points early on, but the main test of the day was the Gap Road, with its pock-marked surface, rogue sheep and low clouds. A breakaway of four made an early escape, and after just the right amount of wheel-sucking the winning move was made [Mr Ferrie being the wheel sucker and winner of the hill – regards, D O’Toole]. The perilous descent was negotiated safely and the rolling hills around Blessington Lake saw plenty of further duels, with the A3 riders showing the lower ranks how it was done on several occasions. Things calmed a little as a coffee break was called for in Kill. However, this was short lived as, with scalded tongues, we were again rushed on by our leader into the day’s first puncture. This held things up briefly, but halt the suffering entirely it could not and the approach was made to the final hill of the day from Saggart to the Embankment, with A3 again prevailing. The nine riders covered 100k-145k, taking into account their rides to and from home, over the profile shown below. Click on the spiky, McNamee classic to reveal the precise details. No Replies to "'The nine suffered nightmarish ICL Hill TT flashbacks' - Saturday's spin earned memorable status "